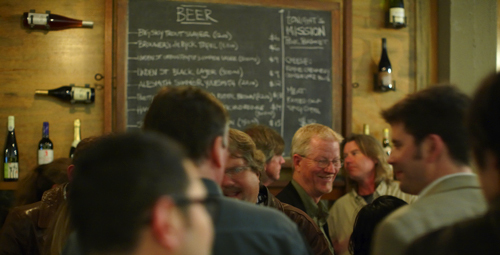 UPDATE: the UC Davis conference about terroir has been postponed to November 2012. I have the great pleasure to announce that Wine From Here will be shown during Terroir 2012: It’s Not Just About Wine, a UC Davis conference precisely about the central topic of the film: the notion of “terroir”. I will be there introducing the film, showing the film and exchanging with the crowd afterward. The term “terroir” refers to the somewhat mystical relationship between the land on which grapes are grown and the wine produced from those grapes. However, the concept of terroir can be applied not only to wine but to many other foods that we hold dear and commonly consume. The agenda is packed for 3 days of stimulating speakers and ideas. Presentation topics include the notion of terroir for chocolate, cheese, salt, honey, oysters, truffles, as well as tea. Elbow nudge: the presentation about tea will be given by Kevin Gascoyne from Camellia Sinensis, by far my favorite tea provider here in Montreal. Additionally, other presentations will address the definition of terroir (of course! ), its regulation and its marketing aspect. All in all, it will be a comprehensive and educated reflection about terroir, and I’m really looking forward to it. See you there at the beginning of May! Today, the use of sulfur dioxide (SO2) is widely accepted as a useful winemaking aide. It is used as a preservative because of its anti-oxidative and anti-microbial properties in wine, but also as a cleaning agent for barrels and winery facilities. Sulfur dioxide is one of the most effective tools that a winemaker has to protect wine and influence what it will taste like. Still, that does not mean adding SO2 to wine is a necessity. Although the reality is that almost all winemakers do it. The free SO2 portion (not associated with wine molecules) is effectively the buffer against microbes and oxidation. Whereas the bound SO2 portion (associated with wine molecules) is the part which has already done its work and cannot be useful any longer in this context. Allow me to geek out and say that because the pH of wine is between 3 and 4, wine does not contain many sulfites (SO32-), but plenty of bisulfites (HSO3–). So is it right to say that wine “contains sulfites”? In chemistry, a sulfite is a compound containing the SO32- ion. So technically, bisulfites are sulfites too. Conclusion: it is right to say that wine “contains sulfites” but the chemist in you should understand that wine “contains bisulfites”. The “contains sulfites” warning is seen on the large majority of bottles. 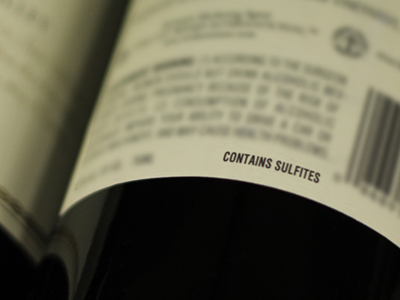 The warning “contains sulfites” found on the large majority of wine bottles in the US is referring to the fact that SO2 has been added to the wine. Since 1988, all imported and domestic wines, beers and spirits sold in the US which contain more than 10 ppm of total SO2 are required to have that “contains sulfites” warning. The EU has required a similar warning label since 2005. This warning exists because a small minority of people are highly allergic to sulfites, as we will see in a bit. In comparison, USDA-certified organic wines do not contain any added sulfites (which does not mean the wine is “sulfite-free”). As you might have realized in wine shops, only a small portion of wine sold in the US are certified organic. 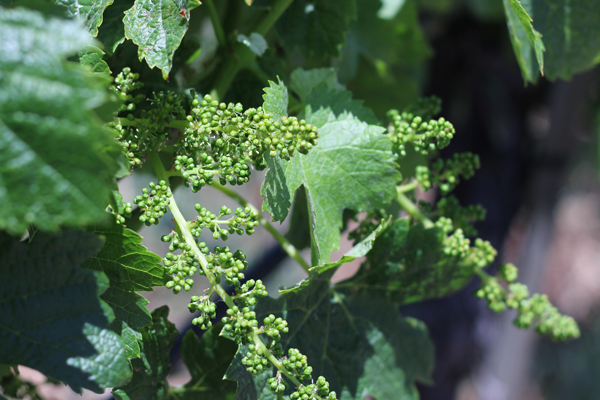 The reason is that very few winemakers will take the risk of not adding any SO2 at all. In fact, in California, I know of only 2 winemakers: Tony Coturri and Chad Hardesty. 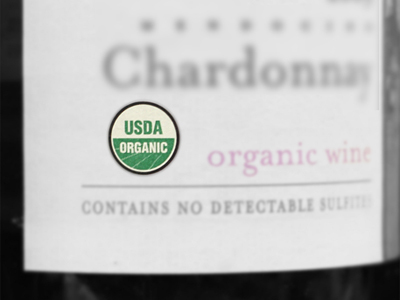 USDA-certified organic wines are extremely rare. It is more common to see the “made with organic grapes” mention. But that tells us about the grapes only, and not about how those grapes were turned into wine. Indeed, you can have some “organic grapes”, add many things to the juice in the winery, and still have that “made with organic grapes” mention on the bottle. 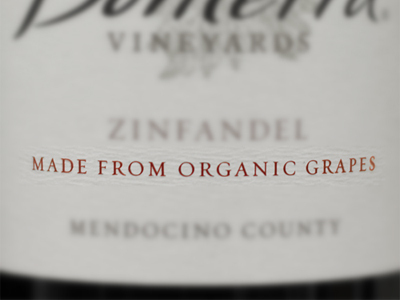 The “Made from organic grapes” as seen on a few bottles. Just like you do not want microbes in your food products, you do not want microbes in your wine either. And having some SO2 in your wine, especially in its gaseous form called “molecular SO2“, is extremely effective in killing wine microbes. Of all 3 forms free SO2 can take in wine, only the molecular SO2 is volatile and thus can be detected by our nose. Humans’ sensitivity to SO2 vary widely. According to Dr. Murli R. Dharmadhikari from Iowa State University, an initiated nose will be able to detect SO2 in wine in the range of 15-40 ppm or higher dosage. The odor is similar to the smell of a burnt match. Concretely, what is happening is that the HSO3– ions bind with the aldehyde (the culprit for the oxidative smell) to form a harmless and odourless molecule. Thus the HSO3– ions effectively strip the wine of its oxidative character. That’s a good example that SO2, when used adequately, helps to maintain a wine’s freshness. [M]any wine authorities will tell you that it is impossible to make a wine which ages well without using sulphur dioxide. This is just not true. The SO2 drastically inhibits the process of oxidation. The alternative is to control oxidation. This way of thinking has been echoed several times during my interviews with natural winemakers. All of them told me they were trying to use as little SO2 as possible. SO2 kills the life (yeasts, bacteria) on the grapes, in the juice, and in the wine. It kills the bad stuff, but it also kills the good stuff. This point is crucial: that good stuff is what is needed to make a wine with a sense of place. So how do they make sure you keep only the good stuff in your wine? They all told me the same thing. They must use high quality fruit (organic at a minimum, good ripeness, no mold), and they keep their winery (equipment, destemmer, barrels) clean all the time. More on that later. SO2, particularly for white wines, is important for freshness. […] Given that a winemaker has very little control over the wine’s storage conditions from the time the wine leaves the winery until it is consumed, it is little wonder that SO2 is so widely used to help guarantee that the bottle of wine you open will be fresh and clean, and taste as the winemaker intended. Bottom line here: what you want to avoid is wine oxidation. Do you want three winemaker tricks in order to minimize oxidation, which in turn reduces the necessity to use SO2? The first two tricks are related to wine contents. The lower the pH and the higher the alcohol, the less SO2 a wine needs. Is it a coincidence that several natural winemakers are proud to say that their wines tend to be acid because they want them to pair well with food? The third trick is related to the bottle closure. Whereas a natural liege cork will allow oxygen to enter progressively into the bottle through the cork’s pores, a screw cap or a glass closure will stop the oxygen from entering the bottle. Therefore, using a screw cap means no oxidation once the wine is bottled. SO2 is one of the topics in my documentary film Wine From Here which is about the natural wine movement in California. If you are curious, here is a 4-minute excerpt, specifically about the sulfur issue. Winemaking, winemakers (and their interns) will tell you, is a lot about cleaning in the winery. All surfaces and equipment must be kept clean, not least the barrels about to receive the grape juice. And SO2 can also play a role here. Some winemakers (including some natural winemakers I interviewed) use a mixture of sulfur, citric acid and water to clean the barrels. Some others (again including some natural winemakers I interviewed) burn sulfur sticks inside the barrel to liberate the SO2 gaz and thus sanitize it. How does that translate into the wine you ask? 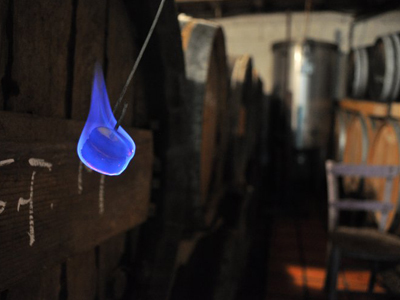 According to Chatonnet, the combustion of 5 g of sulfur in a 225-liter wooden barrel increases SO2 in wine from 10 to 20 ppm. So we’re still talking about a small dose. In his book Environmentally induced Illnesses, Thomas A. Kerns mentions that the FDA asserts that about 0.4% of the US population (about a million people) is highly allergic to sulfites. Another way to put it, as several sources report it, is to say that the group the most at risk is the asthmatics (less than 10% of the population). And only about 5% of this group is allergic to sulfites. Even for moderate wine drinkers, the average level of sulfites found in many commercial wines can cause heartburns or other side effects. […] For them, organic wines are an especially good choice since they contain minimal amounts of sulfites that will in most cases lie below their threshold level. Do you have friends telling you that they are allergic to sulfites because they have headaches when they drink red wine, but not when they drink white wine? Well, that’s unlikely. In general, white wine actually contains more sulfites than red wine. And sweet wine contains even more sulfites then white wine. The explanation for these headaches is not entirely clear, but there are several causes. We often forget that sulfites are also used in the food industry as a preservative. It is mixed in dried fruits (e.g. dried apricots) because of its antimicrobial properties, maintaining the appearance of the fruit and preventing it from rotting. Look on ingredients listings and you will find it. 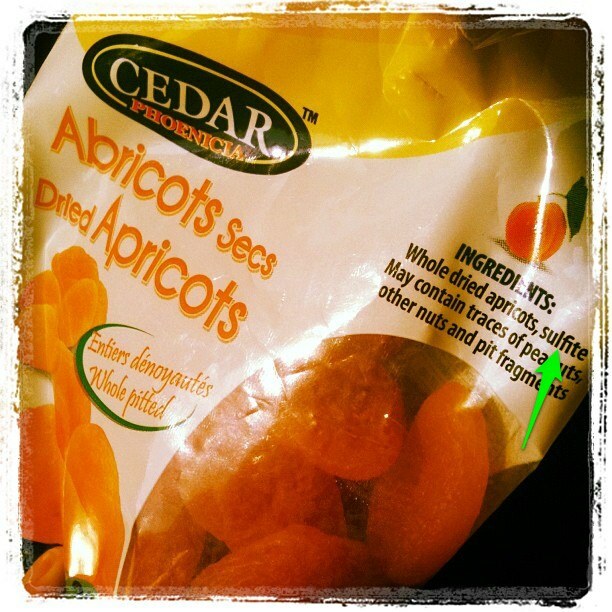 Sulfites are commonly found in dried fruits. It is often called E220 when used in this way. Other examples in the food industry is the use of sulfites as a preservative in molasses, preserved radish or dried potato products. After-screening party’s wine list: unbeatable! Here is the wine list for the after-screening party tomorrow, Thursday September 22. 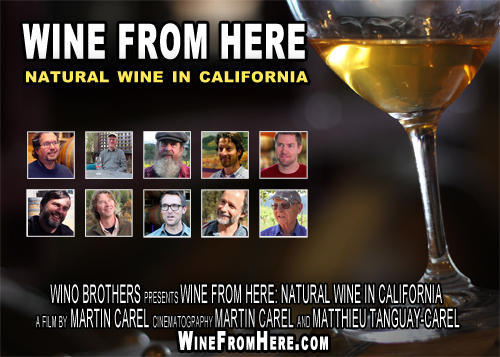 All 10 winemakers in the film Wine From Here have their wines poured! How cool is that?! 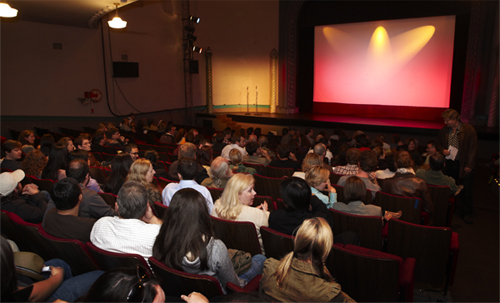 Here comes the second screening of the film, and it will happen downtown Los Angeles! Lots of people on twitter, by email, and in person, have asked me when the film would find its way to South California, so this is it! Price: $15 — includes entry to the film and a 5$-tasting of natural wine! Immediately following the screening, there will be a Q&A with the lead filmmaker. I’ll take all your questions! And around 9pm, you are all welcome to party with us at BUZZ Wine Shop, a recently-opened natural wine bar, 2 blocks from the theatre. 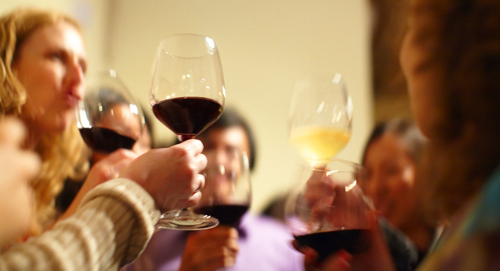 Get this: you will have the chance to taste the wines from all the winemakers in the film! That’s where your 5$-tasting ticket will come into play. Buy your ticket now, spread the word, save the date – September 22 – and get ready for an evening filled with fun, entertainment, wine and friends! Santé! The first screening of “Wine From Here” a success! 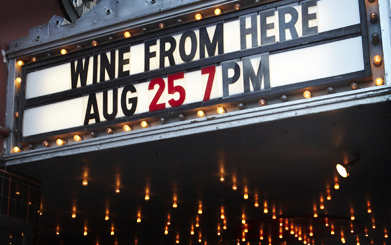 Last Thursday August 25 was the very first public screening of Wine From Here: Natural Wine in California and it all happened in beautiful San Francisco. Based on the turnout and the feedback we received throughout the night, we can proudly say: mission accomplished! The crowd at the Victoria Theatre in the Mission District of San Francisco consisted of about 200 thirsty fans eager to taste this documentary about a controversial topic: the natural wine movement in California. An opportunity to watch 10 prominent California natural winemakers sharing their passion on the big screen. It is quite something – watching the crowd (watching your own work) and monitoring its reaction. Expected laughter for some scenes, but unexpected laughter for other scenes! It was hard not to be nervous. We couldn’t help but ask ourselves: what will the audience think about those 60 minutes which took us a year to put together? After the screening there was a Q&A with the directors, as well as a Q&A with most of the winemakers featured in the film. Lots of questions, lots of opinions, some criticism, some support. In short, some good action! And those 7 winemakers from the wine list were right there mingling at the after-screening party. Picture this: hang out in the most fascinating wine bar in the Mission, and sip on amazing California wines while meeting and talking to the people who made the wine you are holding in your glass. It would be hard to do any better than that! The winemakers from the film were not the only famous people in the room that night. 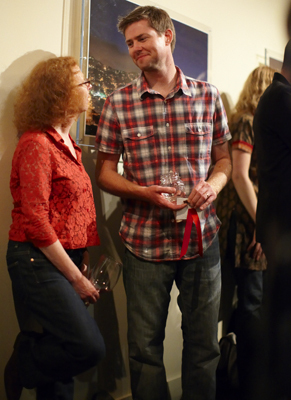 The natural wine queen, Alice Feiring, was also part of the fun. 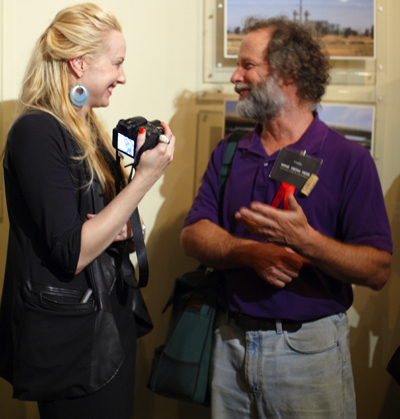 You can see her down below talking with Kevin Kelley, founder and winemaker at the Natural Process Alliance. She was probably telling stories of her road trip to promote Naked Wine, her recently-released book. Now, here’s what’s bugging me: why are their glasses empty? All these pieces put together made for an electric atmosphere. 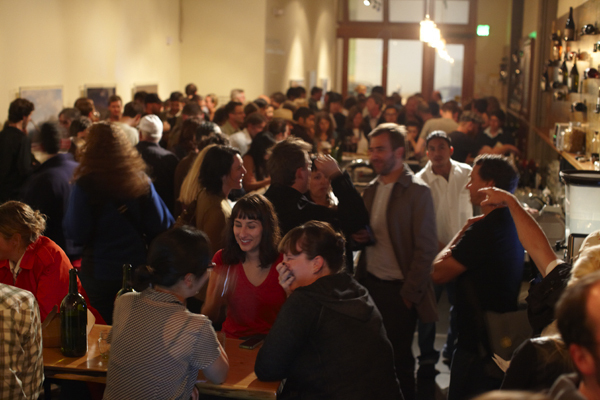 Courtney Cochran, from Eater SF, came down to party and talk to the film’s stars. As I watched party-goers line up four- and sometimes six-deep at the bar to score pours like Coturri’s soulful Mendocino Carignane and Dashe Cellars’ electric dry Riesling from Potter Valley, the quiet natural wine movement’s momentum settled in. Battered by numerous elbows and shoves, any of my ruffled feathers were soothed by the graciousness and eager enthusiasm of the documentary’s featured vintners. Indeed, there was a lot of hustle-bustle! When it was all over, Jeff Segal (Heart’s owner) happily admitted that pouring wine to so many people at the same time was a real challenge. It makes you wonder why you weren’t there as well, doesn’t it? Find the 3 winemakers in this picture! All in all, it was quite rewarding to see so many people that night, joining the fun and celebrating an important project milestone: the very first public screening of “Wine From Here“! Thanks to all of you for your support, your feedback on the film, and also for hanging out with us on that night! Santé! Psst. Here’s a tip: stay tuned for some follow-up action down in Los Angeles in September! I am very proud to announce that the documentary film is now ready to be shown to the public! And what better context than to show it during San Francisco’s Natural Wine Week at the end of August! Price: 15$ — includes entry to the film and a 5$-tasting of natural wine! After the film screening, there will be a Q&A with the filmmakers and the winemakers from the film who will be present in the audience. We’ll take all your questions! And around 9pm, you are all welcome to party with us at Heart, the coolest natural wine bar, just a few blocks down, on Valencia Street. 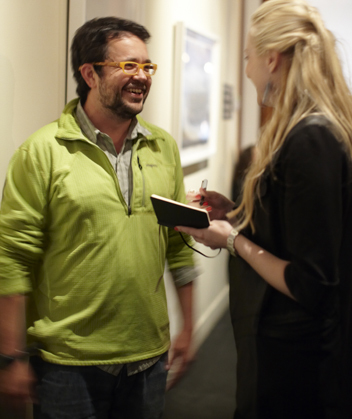 You will be able to meet and talk to most of the winemakers in the film… and have the opportunity to taste their wine! That’s where your 5$-tasting ticket will come into play. Darek Trowbridge (Old World Winery) will be pouring his wine @ Heart! Gideon Beinstock (Clos Saron) will be pouring his wine @ Heart! Hank Beckmeyer (La Clarine Farm) will be pouring his wine @ Heart! 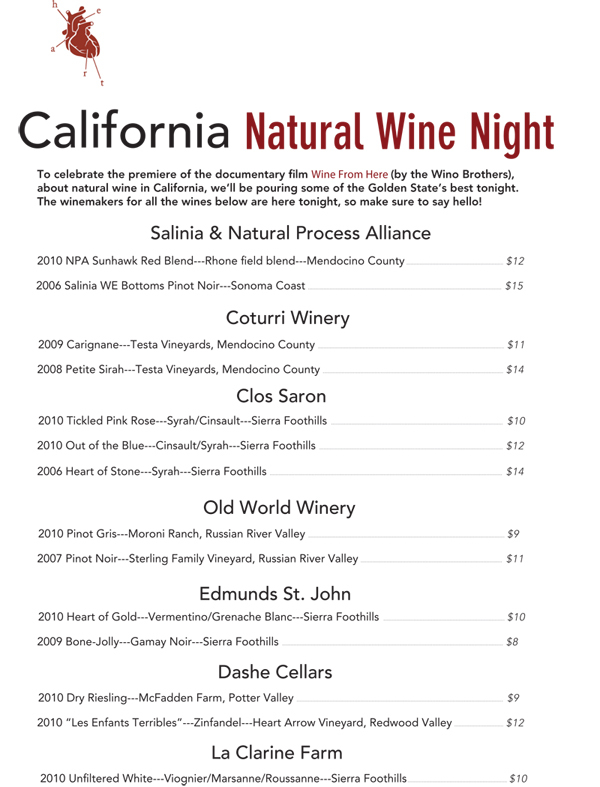 Kevin Kelley (NPA) will be pouring his wine @ Heart! Mike Dashe (Dashe Cellars) will be pouring his wine @ Heart! Steve Edmunds (Edmunds St. John) will be pouring his wine @ Heart! Tony Coturri (Coturri Winery) will be pouring his wine @ Heart! Last Tuesday I visited Paul Draper from Ridge vineyards. You probably heard of the Judgment of Paris in 1976 which, according to many, put California on the wine map? Paul Draper had one of his wines at this event: the Monte Bello 1971. And that Monte Bello Cabernet was among California’s finest wines of the era. I was fortunate enough to interview Paul Draper in his Monte Bello vineyard, on the very top of the Santa Cruz Mountains AVA. We talked quite a bit about California wine history, because I had in front of me one of the pioneers of the current natural wine movement. However, Paul prefers the term “traditional wine”, emphasizing on the fact that the way he makes his wine in the winery today is quite similar to how it was made in the old days, before prohibition. We also ventured into such topics as irrigation, ingredients labeling and overripeness. Interesting bits of info which I keep for the film! Thanks Paul for your time and the good discussions!